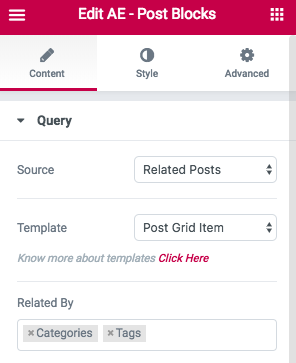 Now you can use Post Blocks widget to display Related Posts section on Single Post Layouts. It works by fetching posts from same terms (like categories, tags) as of current post. You will have full content where to match either categories, tags or both. You can also choose custom taxonomies if you have any. NOTE: This functionality will only work on Single Post Layouts. Follow steps below to show Related Posts section on AE Template created for Single Post/CPT Layout. Drag "AE Post Block" widget at the desired location in your AE Template. Template: Select the block layout you have created to use in this widget. Know more about creating block layout. Related By: Select the taxonomies which you want to match to load related posts. Like select "Categories" if you want to show posts that have same categories as of current post. You can also select multiple taxonomies. Do rest of the settings like order by, layouts etc as per required.